Homemade Instant Pot Chili, made using ground beef and dried unsoaked beans, is the perfect comfort food for a fall or wintry evening. It’s also a great dish to feed a crowd, or for game day. The addition of Masa Harina (corn meal) in this chili recipe thickens the chili and gives it a corn flavor. 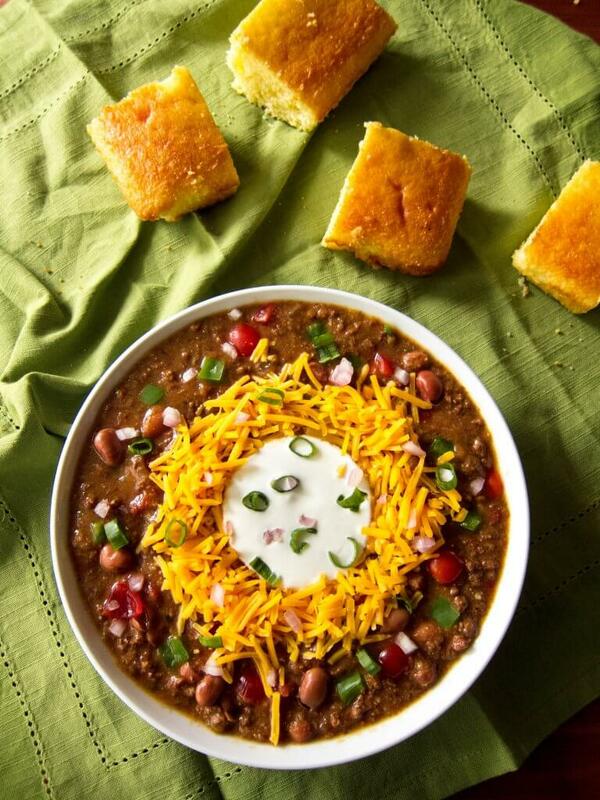 Add your choice of toppings to take this homemade Instant Pot chili recipe over the top! Did you know that October is National Chili Month? It’s not yet October, but the leaves are changing color, the weather’s turning cooler and I’m starting to make soups, stews and other comfort foods. I love the advent of fall and I thought it would be appropriate to post an Instant Pot Chili recipe to observe this occasion! 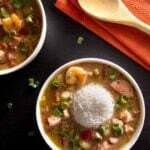 I recently posted a recipe for Instant Pot Gumbo, which happens to be the state dish of Louisiana. And chili happens to be the state dish of Texas. Hmm, maybe I need to keep this going, and cover all 50 states? Chili is derived from Chili con Carne (translated as ‘chili with meat’ in Spanish), which originated in Texas. During the Chicago World’s Fair in 1893, the San Antonio Chili Stand helped popularize Texas chili to other parts of the United States. If you’re inclined to find out more, What’s Cooking America has a fascinating article about the origins of chili. Chili purists might say that chili should not include beans and/or tomatoes. Well, my recipe for Homemade Instant Pot Chili has both beans and tomatoes. Because I happen to like both in my chili. This recipe uses dried beans instead of canned beans. Dried beans are much more economical and don’t have added salt and preservatives. But many of us use canned beans just for the convenience: no pre-soaking, no long cook times, just open the can and pour. The Instant Pot affords you the opportunity to cook dried beans without the inconveniences. The hands-on time for this Instant Pot Chili with dried beans recipe is about 10 minutes. For the rest of the time, the Instant Pot is doing the cooking while you get other important things done! my personal favorite: Fritos corn chips! Cook in ‘Manual’ or ‘Pressure Cook’ mode for 5 minutes of high pressure. Do a Natural Pressure Release (NPR). Proceed with the recipe as usual. – This recipe calls for masa harina (pronounced ‘maasa areena’) which is a finely ground Mexican corn flour used to make tortillas. Added to the chili after pressure cooking, the masa harina will thicken the Instant Pot chili and give it a slight corn flavor. – Masa Harina can be found in the Latin/Mexican section of your grocery store or at a Latin grocery store. If you can’t find it, you can either substitute corn meal or take a few corn tortillas and powder them in a blender. – If you’ve never cooked homemade chili before, it’s important to note that the chili powder called for in this Instant Pot Chili recipe is American chili powder which is a mixture of different spices including cumin and garlic. – Please don’t use cayenne pepper or ground chili powder that you get from Asian, Mexican, ethnic markets – you won’t be able to eat this chili; it’ll be too spicy! So be sure to check the ingredient list. I like to use McCormick Chili Powder. – If you have leftovers, you’ll find that the Instant Pot Chili tastes even better the next day, once the flavors have had a chance to meld. If you’re new to the Instant Pot and aren’t familiar with how to use it, please read the Instant Pot DUO Beginner’s Quick Start Guide or the Instant Pot ULTRA Beginner’s Quick Start Guide first and then come back here to learn how to make Homemade Instant Pot Chili. Rinse pinto beans and drain. Add beans to inner pot of the Instant Pot. Pour in enough water to be 1 inch above the level of the beans. Do a Natural Pressure Release: wait for the float valve to drop on its own, about 12 minutes. Once Instant Pot is hot, add vegetable oil to inner pot. Add ground beef to inner pot. Stir with a wooden spoon to break up the meat into smaller pieces and saute until meat is browned, about 3 minutes. Add onions to beef and saute until soft, about 2 minutes. Add chili powder, oregano, cumin powder, cocoa powder, salt, black pepper and cayenne pepper. Stir well and cook until fragrant, about 1 minute. Add beef broth, tomatoes and pre-soaked dried beans (whether using quick Instant Pot pre-soak or countertop pre-soak). Press ‘Manual’ or ‘Pressure Cook’ and ‘+’ or ‘-‘ until display reads ‘20′ (20 minutes). The display will count down from 20 to 0; it will then switch to ‘Keep Warm’ mode and display ‘L0:00’. * After 15 minutes, if you wish to, you can release the remaining pressure by moving the pressure release handle to venting position. Cook until chili is thickened, about 5 minutes. Allow the Instant Pot chili to rest for 5 more minutes before serving, it will thicken some more. This Instant Pot Chili, made using ground beef and dried beans, is the perfect comfort food for a fall or wintry evening. It's also a great dish to feed a crowd, or for game day. 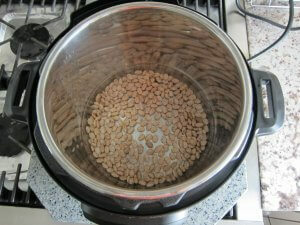 Place beans in a medium bowl and add enough water to be 1 inch above the level of the beans. Let bowl sit on countertop for 4 to 8 hours. Add pinto beans to inner pot of Instant Pot and pour in enough water to be 1 inch above the level of the beans. Cook on ‘Manual’ or ‘Pressure Cook’ mode for 5 minutes. Do a Natural Pressure Release (NPR), about 12 minutes. Press 'Cancel' and open the Instant Pot; drain the beans and set aside. Once the Instant Pot is hot, add oil to inner pot. Stir with a wooden spoon to break up meat into smaller pieces and saute until meat is browned, about 3 minutes. Stir in onions and saute until soft, about 2 minutes. Stir in bell peppers and garlic. Add chili powder, dried oregano, cumin powder, cocoa powder, salt, black pepper, cayenne pepper and stir until fragrant, about 1 minute. Stir in beef broth, tomatoes and pre-soaked pinto beans (use either countertop or Instant Pot quick pre-soak method from above). Cook on ‘Manual’ or ‘Pressure Cook’ mode for 20 minutes. Cook until chili has thickened, stirring frequently, about 5 minutes. - Prep time does not include steps that are already accounted for in the ingredient list, e.g. chopped onions, minced garlic, diced chicken, etc. * The chili powder called for in this dish is American chili powder which is a mixture of spices including cayenne and garlic. ** After 15 minutes, if you wish to, you can release the remaining pressure by moving the pressure release handle to venting position. So if I pre-soak the beans for 4-8 hours, I don’t have to cook them at all? I just add them to the IP when making the chili? And if I do want to “soak” the beans in the IP for 5 mins, I don’t need to fully cook the beans? Whenever I was making chili in the IP, I was using beans that I had fully cooked (20ish mins) already. I didn’t even know there were shortcuts! Hi Shristi – that’s right. Either way, whether you pre-soak the beans for 4 to 8 hours or whether you cook them for 5 minutes NPR, you add them to the IP with the beef and pressure cook with the beef for 20 minutes. Note that if you substitute another type of bean (i.e. not pinto), the 20 minute cooking time might need to change. Also if your beans are older or have been sitting on the grocery shelf for a long time, bean pressure cooking times go up. Good luck and thanks for your comment! We just had it for dinner and it was amazing! I make chili all the time, but this was so much better than my other recipes. Thank you!! Oh, I’m so glad Shristi! I love getting comments like your’s – makes me happy to have shared the recipe! I found you on Reddit and your recipes look so good! I plan to make this chili as soon as weather cools down (still in the 90s where I am)! Do you take requests?? I would love to see a pav bhaji recipe for the instant pot. Hi Jenna – I do have a list of requests, but you might need to be a bit patient – I will put pav bhaji on the list! I’m glad you found me. P.S. It snowed briefly here today! I’m making this again in a month. 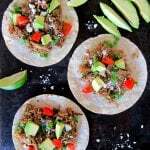 It is so yummy, uses real ingredients, and I love how you fully explain how to use an Instant Pot. I’m a new user and the pictures and words help so much! Your recipes are so delicious and easy to follow and make! Thank you! Thank you for the kind words, Lisa. I always try to write the recipes so beginners and experienced Instant Pot users can follow. I made the chili and really enjoyed it. Now I want to double the recipe to fix for family. Do I need to cook the chili longer? Hi Sandy – thanks for your comment. Make sure you don’t go past the fill line of the Instant Pot. When cooking beans and chili, it should be no more than half full, to compensate for expansion and foam that can clog the valves. See your Instant Pot manual. But to answer your question, no you don’t need to change the cook time if you increase the quantity. I cold-soaked my beans because I had time (and I remembered), but only for 4 hours. That wasn’t enough soaking time, because in the end they came out a tiny bit too al dente. But not to worry, I simmered them on Low for the 25 minutes it took the cornbread to bake and everything came out perfectly. Next time I’ll use the quick soak method. This is the best chili I’ve ever made. Hi Ula – thank you for sharing info about your substitutions. That’s really helpful for other readers. Did you use Pinto beans? Some beans require longer soaking… Glad to hear you loved the recipe – makes my day! After browning.? Not in directions. Hi Doug – I try to use beef that’s not very high in fat, so I do not drain it. If you find that there’s more fat than you like, I would drain at least some of it. Hope you like it. Looks good….. going to try it. Was wondering what I can substitute for the masa? Don’t have any right now. If you have corn tortillas, you can crumble them. You can also sub corn meal. This is the new family favorite. We’ve made it twice and both times it was a big hit. It’s hard to please this family of five with a meal that everyone loves equally but your recipe hits the spot! Thank you so much for sharing this with us! Crystal – ohhh, that is so great! Thank you for sharing that, you’ve made my evening! I hope you find other recipes you like. Hi Pam – I used a 6 quart, so it would work perfectly in an 8 quart too. Best chili I have ever made. I have even made much more complicated chilis with beer, different kinds of exotic meat, countless hours of simmer time, etc. but this chili blows those away! I will be following the same recipe with no edits for many quick chili dinners to come. Wow! 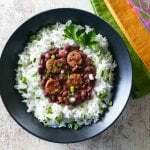 I was looking for an Instant Pot recipe that used dry beans and found your recipe. I veganized it by substituting TVP (textured vegetable protein), vegetable broth and I used a bag of frozen onion/colored peppers from Trader Joe’s and also added one-half bag of Trader Joe’s fire roasted corn. This will be my new go-to chili recipe. I did use red beans and pinto beans, but I don’t think I will do this next time. Thank you for sharing! Thanks, Karen! I’m so glad you liked and I’m sure other readers are appreciative of your vegetarian instructions. I sometimes use veggie crumbles in the stove-top version of this recipe, but have not tried in the Instant Pot! Do you think the tvp should be rehydrated before pressure cooking and if not should the broth be increased? Amy, when I use the soy protein I’ve used the kind that’s in the refrigerated section. So I think you’d want to rehydrate. But I’m not sure – sorry! The masa harina got clumpy and wouldn’t stir in correctly, which I think kept it from thickening properly. What am I doing wrong? Tallulah, did you add the masa in and begin stirring right away? If you pour it in and delay, it might clump. Or is it possible that your chili was already a bit thick? I would suggest that maybe next time, pour in a little less and stir, and add more only if needed. And when you pour it in, do it in by spreading it out in a circular pattern rather than dump it all in. Let me know if you have further questions. I hope you get to try it out again. Using a sifter helped me on this step. I made this for my family this past weekend in my new (Christmas gift) Instant Pot and it was delicious! My only changes were to add fresh peppers (jalapeno and serrano) into the pot and also to remove chili powder and sub in dried habanero powder. Mine had a great kick and everyone loved it! Thank you for the recipe! Hi Bobby, thank you for sharing your adaptation. Oh, yeah – habanero would give it a kick! I use chipotle peppers sometimes. I would like to use kidney beans/black beans instead of pinto beans. How does this change the timing? I think you can keep the cook time the same for kidney beans and be fine. You might be able to decrease the black beans cooking time by 5 minutes. If I made day before, how best to reheat and serve the next day in pressure cooker? Hiya James – thanks for your question. I would reheat it using the Pot in Pot method. Get an oven-safe dish that will fit in the Instant Pot without being a tight fit. Put 1 cup water in the inner pot, put a trivet in the water, put your chili in the oven-safe dish, cover with foil (optional), pressure cook for about 3 minutes. Any idea on how long to cook for if omitting beans? Sadly I am the only one in my family who like them. Thanks! Hi Nesa – oh, yes those persnickety family members – I have some too 🙂 Without the meat, you should be able to cook it it 8 to 10 minutes. You’ll definitely want to reduce the broth quantity. Thanks for visiting! So delicious! We used some leftover beef roast and fresh cubed pork loin instead of ground beef. Thank you, Linda! Oh, I’m sure it was super tasty with cubed beef and pork! This was the very first recipe I made with my Instapot and it was wonderful! I may have had better chili in the past, but I don’t remember when! Hi Eric, thanks for your comment – such a nice compliment! Hope you enjoy your new Instant Pot. I made this with a combination of hot pork sausage and ground beef. Also added a large can of crushed tomatoes. Fantastic!! Thanks for sharing your modification; so glad you like the recipe. One of my faves. I have tried 3 or 4 other Instant Pot chili recipes and this is by far the best. The masa harina thickens the chili just perfectly. I add another 1/2 cup beans as personal preference, otherwise follow the recipe exactly. Thank you Neena! Awesome, Robin! Thank you – that means a lot to me. I love this recipe too! Excellent chili! I added a little more heat because I like SPICY! This was my first instant pot chili and really good. It had a kick, but all 4 of my kids still enjoyed it. I only had dried kidney beans on hand and used those without changing anything and it came out great. Thanks for the recipe! Thanks, Gabrielle, for commenting, and for letting us know that regular kidney beans worked fine for you. Great chili! Thanks for sharing! I used my stovetop pressure cooker, & the chili was delicious! My husband said it was the best chili he’s ever had! Awesome, Alicia! I used to make this on the stovetop, but not pressure cooker. Glad you liked it, and that’s a great compliment from your husband! I really liked this recipe. I was making it for a large group at a potluck birthday party. I used a red bell pepper, a jalapeno and a carrot to add some veggies. The masa really thickened it up and had to pour a bottle of beer in to loosen it up and then some water when I reheated it. It was a hit all around. I cooked it in a pot for over 4 hours instead of the instant pot as my wife decided she needed the pot. it worked great. Thanks for your comment, Lance. The Instant Pot loses minimal liquid from evaporation. So when you cooked it on the stovetop, the final result before adding masa harina was probably already thicker than it would be after pressure cooking. Next time just add some more liquid during the initial cooking period. I love this recipe! I’ve made it several times already to universal acclaim. Since there are a fair number of vegans among us, I use soy crumbles instead of beef, and I use minced jalapeños and some little peppers from our local Indian grocery instead of cayenne powder. At the end, after cooking, I add sauteed zucchini chunks and frozen corn. The masa harina not only thickens, but it also adds a lovely soft flavor. I use a large can of tomato sauce and Better Than Boullion vegetable flavor for the stock. Thanks for a great, crown pleasing, fun recipe. Thanks, Joan, for giving us your modifications to make the recipe vegan. Good to know that soy crumbles work well. I used soy crumbles in the stove-top version of this recipe sometimes but never have in the Instant Pot. Good to know. Found this recipe when I was in A pinch and it turned out perfect. I did the instant pot quick bean soak since I started this late in the day. The mixture of spices is perfect and so much better than a packet. Although I usually make my chili much hotter, we had a guest who is not fond of heat, so others added additional spice or heat to taste. I love the addition of bell pepper and I added celery as well. I will make this again! Thanks Norma! I have been awed by how many people really love this recipe as much as I do. Thanks for your comment and review – I appreciate it. This chili is just about the best I’ve ever made! I’ve never used dried beans because I never have time for pre soaking when I decide I want to make chili, but the instant pot made it super easy and gave a much better texture than canned. I followed the recipe to the letter using yellow bell pepper and the heat level was perfect for sensitive eaters. I added a dollop of sriracha to individual servings for more intensity and that blended nicely with the other flavors. I did omit the masa harina because we used fritos to top and that did the same thickening job and made the leftovers perfect for chili dogs the next day. Not that there was much left! This is my new go to chili recipe. Thanks so much for sharing it! I love hearing this, Jean! I too have tried so many recipes and love this one the best. Thanks for taking a moment to comment and rate the recipe – I appreciate it! There are WAY too much liquid in this! Not only that, it natural released for 40 minutes before I flipped the switch, so the times are very misleading! This seriously wasn’t much faster than cooking in the crock pot for me. It took me a little over 2 full hours to make this. Rachelle – I’m sorry to hear that the recipe didn’t meet your expectations. My natural release time was as stated in the recipe, but it’s possible yours took longer. Keep in mind that you can release pressure after 15 minutes and still get pretty good results, similar to full natural release. Sometimes the float valve gets stuck in the up position and if you gently touch it with a chopstick, it drops. The chili thickens up substantially with the masa harina and by allowing it to boil in ‘Saute’ mode. This chili was easy to make and delicious. Great flavors. Thank you, Lisa – glad you liked it! 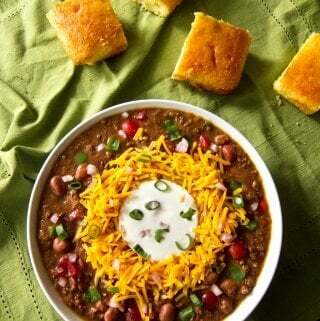 Made as written, very good and even rated a great alternative to Texas Chili by my snobby hubby! A high honor. I’ll take all the honors I can get, Ellen 🙂 Thanks so much for sharing your feedback. Thank you for the wonderful easy recipe. My family loved it and enjoyed it until the last drop. Prabha, thanks for taking the time to comment and rate the recipe – I’m so happy that your family liked the recipe! Wow, this is great! I just got my Instant Pot, and I’m not a cook — your instructions were so clear and made it easy. Thanks!!! Jane, I try to always remember that there are Instant Pot newcomers trying my recipes all the time so I try to make sure they are written for new and experienced owners. Thanks for the feedback. I’m a little confused about the chili powder. The TIPS section says “… it’s important to note that the chili powder called for in this Instant Pot Chili recipe is American chili powder …” but the recipe itself calls for “3 Tbsp Mexican chili powder.” Is American chili powder the same as Mexican chili powder? If not, which should I use? Hi Terence, in all this time you’re the first to mention this. Yes, that is confusing! I was trying to distinguish between Indian chili powder (since I have many Indian readers), and the Mexican chili powder found in the US. I will change the tips to be more clear. So to answer your question, it’s the Mexican chili powder 🙂 Thanks for your comment. Thanks! Sorry to be a pest, but just went to a Mexican supermarket. They had at least 4 kinds of chili powder (Chile Nuevo Mexico Molido, Chile California Molido, Chile Molido, and something like Pasillo Chile). Are all of these ok to use, or is there one that is preferable (or another that I didn’t list)? Terence, if you go into the recipe card and click on the chili powder link it will show you the kind I use for this recipe – it’s a regular grocery store ‘Mexican chili powder’. Very tasty. Alterations: 4 cups fresh tomatoes, regular corn meal, 1 lb ground turkey, 2 Tbl. Chili powder, a dash of red cayenne. I used Beef Better than bouillon. I would have made it with the amount of spice called for but Mom doesn’t like things too spicy. I think it’s the best chili recipe I’ve tried yet. The corn meal makes it interesting, I like it. Thanks! Thanks for the comment, Felicia, and for sharing your modifications – that’ll be useful to others. 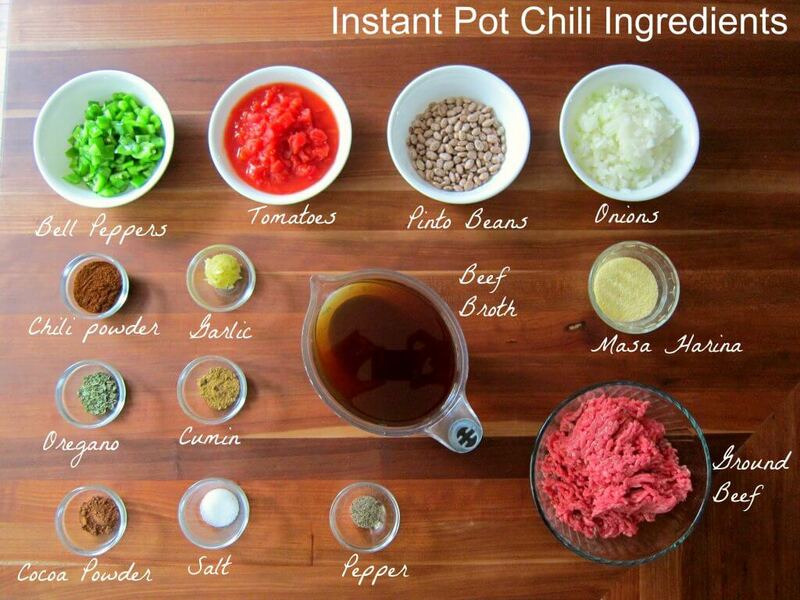 This is my all time favorite instant pot recipe… follow it exactly and you will have Chile that everyone raves about! Awww, thank you Carol, for your kind words! I love it that you’re making the recipe for others! Great. Added Guiness for some of the broth and jalepenos and poblanos. Cheryl – oh, that’s a really interesting addition – I don’t think I’ve ever added beer to my chili before – I’ll have to give it a try! Love this recipe! Tasty, easy and quick. Thank you for your comment, Joan. I’m happy you liked the recipe. Outstanding, very, very detailed instructions on preparing this dish! I haven’t tried this dish yet but will tomorrow. Ingredient list and process seems legit! Oh and I was born and raised in Texas. Those that say beans and tomatoes don’t belong in Texas chili are contestants in a competition! Hope you liked the recipe – yes, I’ve committed the ultimate Texas sin haven’t I? Thanks for your kind words. This chili was so good that my family ate the whole batch the first night and insisted that I make it again the next night. I used the quick method for preparing the beans. What a time saver!